Hilarious imagery, and timely in light of the Army's decision last week to cancel the original solicitation for Ground Combat Vehicle (GCV) proposals. Secretary Gates has made the point repeatedly that while industry is to blame for a great many ills of the acquisition and contracting process, the government has its own responsibility to ensure that requirements are well-defined, stable, and ultimately, satisfiable with a reasonable amount of risk. * No need to parse the translation, Positroll and other German speakers, if it's not totally accurate. Those are the Economist's words, not mine! If you're a frequent reader, you'll surely have noticed the drop-off in posting frequency lately. There are a lot of reasons for that, and I could sit here and compile a list of excuses that would be alternatingly sensible and pathetic, but I'm not going to do that. I'm just going to highlight a trend that has certainly impacted the way that I think and write lately, one that's more worrying to me than my own personal laziness. As Schmedlap has noted before (several times, probably), most of us don't read national security blogs or follow security analysts and commentators on Twitter in order to get our daily dose of partisan domestic politics. I completely agree with him on this one. I'm not particularly interested in what my dentist has to say about gay marriage, or how my rugby coach feels about constitutional interpretation, or really even what my colleagues in the office have to say about the stimulus bill. Domestic politics, as everyone knows, are right alongside religion as just one of those things you don't generally want to get into with people you don't know very well. Ideology, upbringing, socioeconomic class, ethno-linguistic group, etc etc -- there are a whole bunch of factors that impact an individual's politics and often make that class of beliefs entirely obscure to reason and rational argument, so it's usually best to just skip the whole thing. Our present problem is that it's becoming increasingly difficult to talk about national security without brushing up against politics. The two subjects have never been entirely firewalled from one another, of course; the way people felt about the country's general approach to the Soviet Union during the Cold War was largely informed by questions of ideology, and a big chunk of the security issues that have sprung out of the stultifyingly-labeled "post-9/11 era" have broken along party or ideological lines. It's sort of the very nature of a world in which we view "homeland security" as an extension of national defense, really. We've had the luxury as Americans, in our relative geographic isolation, of viewing the physical security of our territory as almost an afterthought to the category of issues that we discuss under the heading of "national defense"; this latter subject mostly pertains to forward defense, or the defense and/or protection of American interests and installations abroad. September 11th changed that to some degree, but the politicization of terrorism and security in the intervening decade has done far more to bring down that wall of separation. Security demagoguery and the easy, thoughtless employment of scare tactics mean that every issue has a public safety component -- even immigration and the construction of houses of worship. So why is this a big deal now, you're wondering? Well, hopefully you're not wondering, because it's pretty obvious. The Park51/"Ground Zero Mosque" controversy -- along with recent poll results showing that a significant chunk of Americans (and a near-majority of Republicans) are confused about the president's professed faith -- has offered an interesting window into the way that ethno-sectarian bias and amateur theology inform the politics of many, many putatively "scared" Americans. The way that so many national political leaders (on both sides of the aisle, I should note) have hewed to simple nativist narratives and trampled on the true meaning of the American political ideal has driven home for me just precisely how inextricable politics are from the national conversation about security and defense. Just this morning I had the unfortunate experience of overhearing half an hour of CSPAN Radio's "American Journal" on the subject of immigration and the border fence, and the ease with which so many callers are willing to declare an occasionally porous border to be a "national security issue" or a "problem for the military" or a "massive opportunity for terrorists" has helped to underline this fact. While the blog has suffered, I'm spending a lot more time lately expressing my feelings about all of this on Twitter. That's not necessarily a good thing for the blog, because it keeps me from writing longer-form things on occasion, but it's allowed me to broaden the network of people with whom I interact and to get a two-way exchange going instead of just screaming into the wind. I've met a number of really interesting people and been exposed to issues, opinion, and analysis that I otherwise wouldn't have been. It also means that my thinking and writing have reached a slightly greater audience, and some of those people are really mostly politics people who just like a side of national security in the morning. (This has the added effect of sometimes delivering ego-boosting moments like the one I had on Friday, when Adam Serwer linked over here and called Ink Spots an "excellent national security blog you should be reading." Which is really cool, but sort of makes me point for me: Serwer blogs for the American Prospect -- a no-bones-about-it partisan publication -- on civil rights and criminal justice, two issues which now brush up against national security but are very definitely not a part of my area of so-called expertise.) That's fine, and I enjoy the exchange, but I'm not sure it's helped in the big picture. I also fear that the self-selection of blog reading exists at an accelerated, micro-level with Twitter, and so I'm hearing and seeing and talking with a whole lot of people with whom I already generally agree. Anyway, this is long enough, so here's the tl;dr version of everything you see above: It's hard to talk about how to defend this country and advance its interests when it seems the very nature of what this country is and what it will be in the future is in question. More than any other excuses I can make about being busy at work or harried at home or travel or other priorities, I keep coming back to this: It's just not very fun right now. BRIEFLY ADDED: Just after posting this, I read this column by E.J. Dionne. I was expecting to hate it, but it actually turned out to be pretty good. The most interesting part: in criticizing the president's disdain for "politicking," Dionne writes that "[i]n a democracy, separating governing from 'politicking' is impossible. 'Politicking' is nothing less than the ongoing effort to persuade free citizens of the merits of a set of ideas, policies and decisions." Then I saw a tweet by Patrick Barry in response to this post: "Sadly, greatest near-term [national security] challenge may be moving past divisive shouting that prevents real debate on security." Which is a sentiment that I generally agree with. But here's the problem: if Dionne is right (and I think he makes a compelling case), then partisanship and division is essential to the proper functioning of the American polity. But it just doesn't work for national security, and what seems to have been the tacit historical acceptance of that fact by all parties to the conversation is now being ignored. "Mostly Dead" must describe the horse it was beating - or so I thought. But alas, it is another post-mortem on the Armor Corps. Granted, LTC Weiss seems to fall somewhere between COL Gentile and MAJs Smith and Harbridge when it comes to his thoughts on "how dead" the Armor Corps really is. But this is still what I'm starting to call "Old Tanker Syndrome" (and yes, I noticed that LTC Weiss is an artilleryman) - or OTS. OTS seems to cause those it afflicts to see the Armor Corps through the lens of their pre-Iraq experiences, when NTC was king and careers were made out of the brigade breach into the Northern Corridor. I'm not going to call it nostalgia - I don't think Gian is nostalgic - but their formative years in the Army were defined by these realities. I think that the biggest symptom of OTS, though, is a pre-GWOT conception of combined arms operations. For these older field grades with OTS, combined arms operations are those brigade breaches and large maneuver formations - both Gian and LTC Weiss refer to them as lost capabilities. I have to say, as a former company grade, that I take umbrage at that. Tell any lieutenant or captain who has lead in Iraq or Afghanistan that they don't understand combined arms operations because they've never done an old school breach or brigade live-fire. Go ahead. I dare you. Or maybe these young officers know combined arms better than their superiors - or at least more advanced at younger grades. They know how to work with host nation forces, call in fixed- and rotary-wing fires, artillery, and work with dismounts (conventional and SOF) and mechanized forces. Simultaneously. As lieutenants. If that's not "combined arms" then I don't know the meaning of the term. And let's take a look at this focus on brigade and above operations. Do both of these experienced officers really believe that younger officers are "unschooled" in combined arms because of the nature of decentralized counterinsurgency operations? Both current theaters have plenty of examples of large-scale, combined arms operations - but just because the unit's front is more circular than linear doesn't dismiss the fact they are brigade-level operations. Further, employing weapons systems in this manner requires greater understanding of their capabilities because of the greater risk of fratricide. Even during the invasion of Iraq, which was a corps-level operation, all I ever cared about was my commander's intent two levels up, my mission, and the missions of the units to my left and right. After the invasion, nothing changes except I now had to worry about what the units to my front and back and indigenous forces in the AOR were doing. Decentralized operations are the same in high- and low-intensity conflict. Even at NTC, I couldn't tell if we were doing a company or brigade operations, except that latter had three times as many observer/controllers wandering around. It doesn't matter to a company-level officer. Just as experience at corps-level operations isn't a prerequisite to effective leadership of battalions. What I'm trying to get at, in a verbose way, is that today's younger officers are probably the most tactically competent officers our nation has seen in a long time with regard to maneuver and combined arms operations. Where I'll agree with Gian and LTC Weiss is that technical skills such as gunnery have atrophied - but this can be easily remedied. But the fact remains - the principles of warfare are the same for COIN as they are for HIC and our junior leaders are very, very good at executing those principles. So let's just stop with this "Armor is dead" leitmotif - it's not, nor is it endangered. Don't let OTS jade your perception of the quality and esprit of our Armor Corps. Please. If Abu Muqawama and Ink Spots didn't solidify it already, this ought to cement the Washington Irish as the go-to rugby club for defense and security analysis: teammate Bob Guido published a paper in SWJ yesterday that seems like just about the best resource I've seen lately on the subject of U.S. efforts to interdict al-Qaeda financing. The United States and the international community have made great strides against al Qaeda since September 11, and counter-terrorist financing policies will remain a vital component of future efforts. The successes in tightening and shoring up the international financial system in the post-September 11 era, however, cannot be taken for granted. Al Qaeda and its affiliates have shown remarkable resilience and an ability to structurally evolve to survive the best efforts of the international community. To maintain progress in squeezing al Qaeda’s finance, governments will need to continually adapt counter-terrorist financing policies to address the simpler but untraceable methods of moving cash and assets such as hawala, and work collaboratively to combat alternative methods of finance that capitalize on the ever-present and growing field of international criminal activity. A Number of Voids Need to be Filled. With a New CMR Paradigm. In a post this morning, Dr. Finel extrapolates upon my post yesterday and his own from the day before. Keeping this post from from Adam Elkus in mind, I have to say that I agree with everything Bernard has written in his latest. Except for one thing. I am not making the Yingling argument from "Failure in Generalship." I was just noting that I see the nature of military culture filling the void of strategic incoherence. Where I disagree, vehemently, with COL Yingling is that in no way, shape, or form should generals fill that strategic void with operational art. Observing that this is occurring is not the same as endorsing this reality. I stated that our civilian leaders need to provide the military with strategic leadership and I stand by that: it is how civ-mil relations should be balanced in our system and we're witnessing the repercussions of their failure to provide that leadership. Operational art is no substitute for strategy or grand strategy. But as this conversation has progressed over the past day or so, I agree with Adam that civilian leaders are unlikely to provide that strategic guidance any time soon. So now what? Honestly, I have no idea at this point. But I think this should cause us to pause and think about what civ-mil relations should look like in an era of strategic uncertainty. Military officers dictating policy because civilians can't or won't is not a durable solution (especially in the arena of public lobbying for war support). A new paradigm must be created and new lines of responsibilities need to drawn, because the current system does not support the strategic realities we're facing now and in the foreseeable future. I don't know that Bernard would agree with me here, but I still see it as incumbent upon the civilian leaders to create the new rules or military culture will continue to expand and fill the strategic void. Where Bernard and I likely agree is that we can't continue to allow that expansion to happen. Bernard Finel has a very good post on civil-military relations - a topic he's written very often on. His main points are concern over the politicization of generals driving policy, that blame doesn't really matter, that presidents can fire generals but doing so is tricky, and that presidents often use the uniforms to see wars. I have to say that I find Bernard's arguments compelling and on the mark. Sure, generals are often over-political and too often drive policy and therefore there is an imbalance in what we should consider "normal" civ-mil relations. And he's right that everyone is to blame: the generals should know better and the politicians should have tighter reins. But I think he's leaving one point out: the nature of military leadership. U.S. military doctrine demands that leaders act based on their best interpretation of their commander's intent. If that intent is nebulous enough, subordinate leaders have wide flexibility of action. And that's where we've come to in Afghanistan. Our Afghan strategy, if you could call it such, is horribly vague to the point of uselessness, which I see has a failure in leadership at the highest levels here in DC. Any general, with 30-plus years of leadership experience, will naturally fill that void with how he best interprets his commander's intent. In this case it seems to simply means: win in Afghanistan. So I think that is what Generals McChrystal and Petraeus were and are attempting to do. I don't see this as a power grab by the generals and I don't necessarily see the President as trying to use them to sell the war. Nor do I see it as a crisis - yet. But the civilians aren't providing the leadership they should and the generals are filling that void as their nature dictates they should. The only solution to this particular imbalance, in my mind, is not to fire generals, but instead create a viable strategy and policy and provide the generals the leadership they need and deserve. UPDATE: Adam Elkus, via Twitter (@Simlaughter): "To some degree I think the scope of contemporary doctrine often reflects this strategic uncertainty" - This is quite likely. And if he's right, I think the probability of a civ-mil disaster is looming. Slate's got a funny cartoon up -- apparently by a Jack Ohman -- about Secretary Gates' comments on the profusion of general officers at the Pentagon ("a substantial increase in the most senior leadership... a situation where personnel of higher and higher rank are assigned to do things that could reasonably be handled by personnel of lower rank"). It's not quite this bad, but it ain't far off from that with GS-15s/YA-3s and colonels. Col. Gentile is currently a Visiting Fellow at CFR and to start off his time there with a bang, he did this interview with their consulting editor. The interview is titled "Conflicting Objectives for US in Afghanistan." General David H. Petraeus, in his first extended public interviews as chief U.S. and NATO commander in Afghanistan, made news over the weekend when he argued against a hasty withdrawal of U.S. troops in July 2011 and expressed optimism that an achievement of the U.S. objectives there is possible. But Colonel Gian P. Gentile, a visiting CFR fellow who heads West Point's military history program, says there is a mismatch between U.S. President Barack Obama's limited political objectives in Afghanistan, which could be accomplished in some eighteen months, and the U.S. military's "operational objectives." These objectives are "euphemistically called counterinsurgency," he says, and could take a generation to achieve. "We have the means to tactically and operationally achieve success in Afghanistan," says Gentile, but "we become mired in the tactics and operational methods of doing counterinsurgency." I didn't know COIN was the same thing as "nation-building" but I guess you learn something everyday. The argument does strike me as a bit muddled though. Anyway, go and read it and then come back here and argue (and yes, I'm having a particularly slow day at the office). Three Indian peacekeepers were killed overnight in Eastern Congo, the UN reports. Apparently, the base, in Karumba (in North Kivu), was attacked in the middle of the night (2am) by up to 60 armed men who wielded machetes and spears. Several peacekeepers engaged with the attackers, forcing them to retreat, but at least six military personnel were injured in the surprise attack, some of them critically. In the attack, whose motive is unclear, the assailants also stole two MONUSCO weapons. This isn't the kind of thing that the peacekeepers should be dealing with or at least not if you're calling them peacekeepers. But, they are and it's clear they didn't have what it takes to respond adequately (MK, some help here would be nice). That being said, it is clear that the UN's peacekeepers in the DRC have long been a party to the conflict: they continue to provide support to the Congolese Army's efforts to defeat the FDLR and other rebel groups in the East. It's also clear that clinging to this pretense of impartiality, pretending that what is happening in Eastern Congo is "peacekeeping," and not providing contingents with what they need to really do at least a decent job, is completely counter-productive. Finally, the motive was unclear? Umm, how about just scaring these soldiers, threatening them, and sending a message that they are not in control? Meanwhile, in Darfur, the UN/African Union Mission, UNAMID, is building a trench around Nyala and Kalma refugee camp. UNAMID is working with the local government to build a 40km long trench. You'll recall that the area has been suffering from increased crime and violence in recent months. 'The measure is designed to reduce the high incidence of criminality by regulating travel to and from the town,' UNAMID said on Monday, explaining that while the trench would limit entry and exit through small roads, Kalma town will remain fully accessible through major roads and highways. According to the Mission, local authorities will provide 24-hour protection for UNAMID equipment and personnel until the project’s completion. I wonder how much it will help but that's it for today's "peacekeeping update." So go to the comments and give me your top five. Yeah, I know, this is in bad taste, but it's raining outside and the Tweeps demand it! NOTE (because someone will probably make a big thing out of it if I don't post this disclaimer): I don't actually want to punch any of these people in the face, just give them a stern talking-to. So I'm not threatening or entertaining physical violence against anyone. Unlike Ralph Peters, who wants to execute an American soldier who is MIA. I know a lot of my friends and acquaintances in the defense policy world get anxious about Israel. That's often justifiable, particularly when we get to talking about Tel Aviv's adventurism vis-a-vis Lebanon and, more worryingly, Iran. So this morning I've noticed a little bit of agita on Twitter about the recent announcement that Israeli Defense Minister Ehud Barak has approved purchase of 20 F-35 Joint Strike Fighters, a deal that will be financed by American grant military aid. Does this deal threaten Middle East peace? Probably not, but the reality is that it doesn't much matter. This sale is actually a security-assistance success story. So why is the JSF thing not only not a big deal, but actually kind of a good deal? Well, for one thing, Israel is the only recipient of FMF that isn't required to spend those U.S. aid dollars on U.S. materiel. They can use a quarter of the cash to support their own defense industrial base, so the choice to purchase a U.S. system is really a best-case-scenario when it comes to big-ticket, sophisticated defense articles. If that cash is headed to Israel no matter what, at least they're buying F-35s and not Rafales, Gripens, Eurofighters, or whatever else: foreign military sales help to keep U.S. production lines open and warm, lower unit costs for the U.S. military, and generally mitigate system risk. So don't panic! This deal worked out about as well as it was ever going to. This is a boost to the F-35 program, which needs pretty much all the help it can get. The conditions of the sale are generally pretty good for the U.S. And let's be serious: do you think the Israelis are going to have a less difficult time threatening their allies with F-35s than they currently do with F-15s and F-16s? Especially in light of the fact that QME considerations already limit U.S. sales to Israel's neighbors to less capable systems? A friend sent me a link to this podcast/media call with CFR's Stephen Biddle. He just got back from Afghanistan and since I wasn't on the call and I haven't heard it yet (and it's Friday and kind of slow and I should listen to it for work anyway), I thought I could listen and live blog it (so to speak). If this turns out to be total crap, well I'll have tried a different way of blogging. The plan is to hit post when I'm done listening. First, he argues that COIN is less like painting a house and more like doing complex surgery. He argues that it takes just over a year to figure out whether a village has stabilized or not. He adds that in complex surgery, the patient may get a lot worse before you know whether the surgery will actually work. That strikes me as the way I would explain something to my grandmother but ok, I get it. He says casualty rates at the national level don't help much, that we need to disaggregate the levels of violence and whether levels of violence match whatever phase of COIN a particular area is currently experiencing. In his opinion, figuring out how an area is doing requires going through an entire year (or in some cases 18 months depending on when in the traditional Afghan fighting season you started the clearing process) to figure out how that place is doing. He says in part of Helmand, it's been that long and things are clearly stabilizing while in others (like Marja), we're just at the counter-attack part post initial clearing. Then there's a less interesting discussion of timetables, public support and the change of command. Seriously, there's not much there in my opinion, so skipping ahead. Concerning Wikileaks, he argues that it's been damaging because of the effect of having names of people who cooperate could endanger them. He doesn't think these documents as as important as the Pentagon Papers or that the documents, which stop before Obama announced the surge, are counter to the Administration's narrative. This was before Wikileaks announced they were posting more, I wonder if he'll say something different then. When pressed about this "domino theory", he says that people use domino theory when they oppose a war (zing, sort of). He says that regional instability is a wide-ranging international problem and that countries do worry about. He recognizes that Afghanistan are important but indirect. He says it's not a slam-dunk for either side of the argument and it's a value judgment about costs. I think that's fair enough but I also think he should have more of an opinion...I agree that it's a value judgment and I agree that the Pakistan disaster scenario is really scary. He also didn't discuss (here) whether it matters to think of it as Afghanistan destabilizes Pakistan or the other way around. Ok, that's it for his initial intro...there's more in the Q&A but to be honest, I got a bit bored so I skimmed through the transcript and I couldn't find something that really grabbed my eye. So what do you think of his arguments? A good news story from Afghanistan. No, really. Since I've been working like crazy lately (hence the dearth of posts), I figured you all wouldn't mind something a little off the beaten path for our usual topics of discussion: Afghanistan's cricket team. After being granted ICC membership in 2001 after the fall of the Taliban regime, they played little cricket until 2009. Since then they've done fairly well for themselves, winning the Asia Cricket Council Trophy this year and sporting a winning record in ODIs, First class cricket, List A, and breaking even in Twenty20 this year. All in all, they have been one of the true success stories in post-Taliban Afghanistan. But problems still remain, in that in spite of winning the ACC, they were omitted from the Asia Cup (the ACC champion has never been omitted from the Asia Cup before). And they'll need to do well there and in the ICC World Cup if they ever hope to attain test status. A lot of it seems to be politics as the stronger teams to the south of them don't seem intent on giving a potential rival a path to international prominence. Hopefully this will change. You can read more on this here. Barring any crazy nonsense, Afghanistan is about to put Scotland out for around 100 in the first innings of an ICC Intercontinental first class. In a battle of highlanders, the Afghans are looking the stronger. But don't worry, Ex, there's always the second innings. UPDATE: Nel and Smith put up a great last-wicket stand, but Scotland still out at 140 at stumps on day 2, trailing by 295. Afghanistan is bringing strong bats and bowling. Great for them. This, more than anything in the text, is a sign of the times. You'll notice that the leading purchasers in the early part of the last decade tended to be traditional partners like Egypt, Israel, and Kuwait, along with our NATO and east Asian treaty allies. For about half a century, security assistance was mostly about satisfying treaty obligations, maintaining regional balance, executing foreign policy commitments, and assuring allies and partners. In the post-9/11 era, as you can see, there's been a shift: weapons system sales are now very often geared towards increasing the fighting capabilities of foreign partners, frequently focusing on counterterrorism. That's why you see states like Morocco, Iraq, and Pakistan on the list, as well as many of the traditional recipients of U.S. gear. You'll also notice that the Emiratis joined the Saudis in opening their wallets, a result of anxiety on the part of the Gulf states about Iran's intentions. The part of the story that's not being told in the graphic: Israel and Egypt are mostly spending U.S. dollars (in the form of State-appropriated Foreign Military Finance, or FMF funds), as are the Iraqis and Pakistanis via a number of different sources of grant aid and COCOM-directed assistance. (On this latter point, I would guess that the value of 1206 cases -- in which the relevant COCOM uses Defense Department funds to purchase capacity-building materiel for a foreign partner, rather than transferring the funds to the customer as grant aid -- is not included in these numbers, but I'm not 100% sure.) As security assistance has become increasingly focused on battlefield effect rather than the more wide-ranging foreign policy and political justifications applied to traditional military aid, the USG and the Department have understandably gotten a lot more interested in what exactly being purchased. This explains why many of the leading purchasers in the latter half of the decade are recipients of grant aid and special appropriations: it's easier to convince a foreign partner to buy the system you think is most appropriate to its needs when it's your cash he's spending. Though nobody much minds that the Egyptians spend their grant money on tanks they can't maintain and aircraft they can't fly, because the objective of that security assistance program is primarily about confidence-building and regional stability, not improvement to fighting capabilities. This highlights a fundamental tension in the SECDEF's stated intent to institutionalize the security assistance and "building partner capacity" missions as core competencies of the Department: increasing dependence on foreign partners to address security challenges demands U.S. force structures and institutions that are optimized to provide support for partner forces. But our partners' awareness that this is our desired approach, and that this approach will demand the provision of certain weapons systems in certain configurations, will often mean that they're able to resist spending their own funds on the gear that we decide is best. In short, we're going to have a hell of a time convincing foreign governments that they ought to spend their own money on U.S. gear when we've got it down on paper all over the place that it's a strategic imperative for us to build their capacity. And: if this just turns into a massive materiel-welfare system, then are we really saving that much cash and effort by transitioning to a more indirect approach, or should we just quit dealing with the myriad challenges of being a massive proliferator and pretty much look out for ourselves? Did you see the news that Secretary Gates has decided to eliminate Joint Forces Command? The plan was to be announced at a Pentagon press conference on Monday. It is part of a broader effort to trim $100 billion from the military's mammoth budget in the next five years, as the wars in Iraq and Afghanistan begin to wind down and Congress turns its attention more to domestic priorities. The Associated Press has learned that Joint Forces Command will be eliminated and its role absorbed elsewhere within the Defense Department. Gates has long said the Pentagon needs to reduce waste and duplication. You'll recall that General Odierno had been named to command JFCOM (his predecessor, General Mattis, moved to CENTCOM). I've had pretty wide interaction with JFCOM and I thought they did pretty good work. Where do you all think some of those functions will end up? Is it a good thing? Man, the Air Force loves them some Boyd! 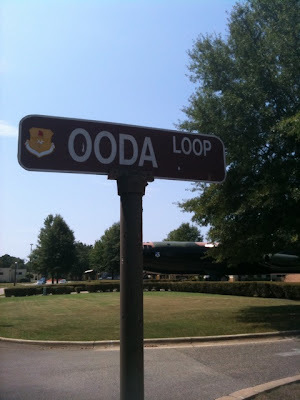 Here's a hilarious photo of a street sign taken by Nick Dubaz, an Army officer who I follow on Twitter (I'm @InkSptsGulliver), during a visit to Air University at Maxwell Air Force Base. If this doesn't make sense to you, read this and this. Everyone knows scare tactics are a favored approach of the defense-industrial lobby. "One day the Chinese will be able to defeat us in the air/at sea/from afar/in space/in cyberspace! ", they say. "The Russians are looking feisty these days, ain't they? ", they might hint. "You know, I understand you guys spending money on language training and tea-drinking and whatnot, but is the Taliban really an existential threat to America?" CHICAGO—With the airline industry continuing to suffer under the ongoing recession, the Boeing Company was forced Monday to lay off Al Freedman, the only guy left at the corporation who knows how to keep wings from falling off planes. "We used to have a whole team of engineers who knew how to make the wings stay on, but those days are long gone," Boeing CEO James McNerney, Jr. said. "We'll make it work, though. The wings are not necessarily the most important part of the plane, anyway." McNerney added that at least they were able to save the job of the guy who knows how to prevent jet engines from exploding. Oh wait, it's just the Onion. In the years since 9/11, Osama Bin Laden has issued more than 20 audio and video statements to spread his view of the conflict between the United States and al-Qaida. According to his worldview, the United States represents Christianity, al-Qaida represents Muslims, Christians won't protect Muslims, the West hates mosques, peaceful coexistence is a fraud, and the "war on terrorism" is really a war on Islam. By spreading this message, Bin Laden works to turn Muslims against the United States and rally them to al-Qaida. Over the past two weeks, in a series of articles and speeches, Gingrich has declared a religious war that suits al-Qaida's agenda almost perfectly. While denouncing "Islamists" rather than Islam, Gingrich has blurred the distinction by selecting as his initial target the construction of a mosque near Ground Zero. Everything Bin Laden says about the United States, Gingrich validates. He then presents a side-by-side comparison of bin Laden and Gingrich's thoughts on the subject of culture/civilizational war. The similarities are striking. Read it. Max has more here on how Gingrich's speech fits into the broader picture of his own political ambitions and divisions within the GOP on security policy. As I've said in the comments to this post, I think this issue is a vitally important one. I'm going to continue my policy of relative silence, though, because as I've said, I lose my mind when I start thinking about Newt effing Gingrich or the people opposing Muslim Day at Six Flags as the vanguard of a civilizational army fighting for ME. F that noise. Mike Allen reported this morning that Frank Wolf (R-Va.), a senior member of the House Appropriations Committee, has sent a letter to the president recommending the creation of an independent, bipartisan Afghanistan-Pakistan Study Group (APSG). The panel would be modeled after the Iraq Study Group, bringing together former statesmen and retired senior military leaders to assess the situation in Afghanistan and Pakistan holistically and present recommendations to the president. We must soberly consider the implications of failure in Afghanistan. Those that we know for certain are chilling—namely an emboldened al-Qaeda, a reconstituted Taliban with an open staging ground for future worldwide attacks, and a destabilized, nuclear-armed Pakistan. I firmly believe that an Afghanistan-Pakistan Study Group could reinvigorate national confidence in how America can be successful and move toward a shared mission in Afghanistan. This is a crucial task. On the Sunday morning news shows this past weekend, it was unsettling to hear conflicting statements from within the leadership of the administration that revealed a lack of clarity about the end game in Afghanistan. How much more so is this true for the rest of the country? An APSG is necessary for precisely that reason. We are nine years into our nation’s longest running war and the American people and their elected representatives do not have a clear sense of what we are aiming to achieve, why it is necessary and how far we are from attaining that goal. Further, an APSG could strengthen many of our NATO allies in Afghanistan who are also facing dwindling public support, as evidenced by the recent Dutch troop withdrawal, and would give them a tangible vision to which to commit. Just as was true at the time of the Iraq Study Group, I believe that Americans of all political viewpoints, liberals and conservatives alike, and varied opinions on the war will embrace this “fresh eyes” approach. Like the previous administration’s support of the Iraq Study Group, which involved taking the group’s members to Iraq and providing high-level access to policy and decision makers, I urge you to embrace an Afghanistan-Pakistan Study Group. It is always in our national interest to openly assess the challenges before us and to chart a clear course to success. At root, a study group for the Afghan war is all about instilling confidence in the Congress and the public, making people believe that the government has a reasonable, sensible idea of what's at stake and how best to achieve America's strategic goals. Whatever the language about the "fundamental" importance of the war, the necessity to deny sanctuary to terrorists and so forth, one can reasonably expect that an APSG would conclude that U.S. objectives in south Asia ought to be more narrowly circumscribed. And who could complain about a study group? Is there anyone that would rather continue muddling through, any real counter-argument to what Wolf is asking for? I can't see any -- even if you don't expect much, surely it can't hurt. I join Wolf in hoping that the president will adopt this recommendation and commission a new Afghanistan-Pakistan Study Group. The congressman concludes his letter by telling the president that he plans to introduce legislation mandating the group's formation if it's not created by Executive Order, and I support that approach, too. To be honest with you, I'm in favor of just about anything at this point that will help us sort out what the hell it is we're trying to do in Afghanistan, and whether the things we're trying to do are really worth it. I don't expect them to conclude that sanctuary denial is a pointless mission, or that the war is unwinnable without access to Pakistani territory, or that the entire episode is strategically bankrupt -- anyone picked for the panel would likely be too invested in the conventional thinking about the war (and about counterterrorism) to propose anything so revolutionary. But the more we think and talk and write about strategy, the more it must be obvious to senior decisionmakers that the best thing for America is to extricate ourselves from the long-term, heavy-presence involvement to which we've thus far been committed. "Time goes, you say? Ah no!/Alas, time stays, we go." It's amazing to me that I've seen almost no mention of this on the blogs or Twitter, but yesterday was the 20-year anniversary of Iraq's invasion of Kuwait. It's so obvious as to seem absurd to write it, but: Iraq is a very different country today. Saddam is dead. Iranian cultural, political, and economic influence is at a high point. (Iranian imports to Iraq will total close to $7B this year, according to a report this morning on NPR.) And Kuwait still plays host to something like half a dozen U.S. military installations. But I'm getting ahead of myself: U.S. forces weren't involved in the conflict until January of '91. On August 2, 1990, four divisions of Iraqi armor and mechanized infantry rolled across the southern border, crushing Kuwaiti resistance in less than three days. It's easy to forget amidst the massive loss of life of the post-Saddam period, but Iraqi and Kuwaiti deaths totalled close to 3,000 during the brief war. While glancing around the Google to see if I'd missed some major commemoration of the anniversary yesterday, I came across an interesting article on al-Jazeera. It's by Nashwa Nasreldin, an Egyptian-born woman who grew up in Kuwait and attended the New English School with several other expatriates. She was 10 when the Iraqis invaded -- exactly my age -- and lost touch with her classmates until several reunited on Facebook. A few of them went back to the school recently for a reunion, and film Nasreldin shot there has apparently been turned into a TV program.